Delhi Chief Minister Arvind Kejriwal has announced Elvis Gomes, who took voluntary retirement to contest from Cuncolim, as the chief ministerial candidate of Aam Aadmi Party. 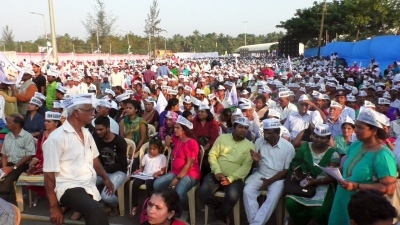 AAP had organised a Liberation Rally in Cuncolim, precisely to make this announcement in his home constituency. Addressing the second huge rally he was addressing, Kejriwal became the second CM to announce that the corrupt would be put behind bars. A similar announcement was made by defence minister Manohar Parrikar in 2012 election, assuring to arrest the corrupt Congressmen as well as the mining barons involved in illegal mining. However, no one was arrested in the last five years, except Churchill Alemao in the then unknown Louis Berger case and he was granted bail after fighting a court battle. Now, Kejriwal has assured to put behind bars the corrupt, both from the Congress as well as the BJP. Chief ministerial candidate and former Inspector General of Prisons, Gomes, also assured the gathering to arrest the fraudsters if AAP is brought to power. 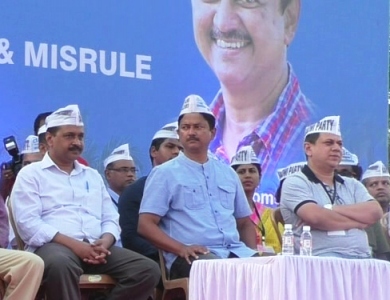 Dr Oscar Rebello, another AAP face in Goa, told the gathering that the next Assembly election would be a straight battle between the joint family of corrupt parties like Congress, BJP and others against AAP. Kejriwal in his speech also came down heavily on the demonetisation policy, alleging that Prime Minister Narendra Modi had took this step not to stop the flow of black money but to waive off the bank loan of his close aides. According to him, the RBI report states that bank loans of total 8 lakh crore rupees were found to have been defaulted while Modi has waived of Rs 1.14 lakh crore of it. He said that this has also been pointed out by the CAG. good move AAP will help goa and the common people. common people will have good experience and will be happy visiting govt offices to get their work done fast AND better. My Dear Goans, Why give power in the hands of Congress & BJP, when we can have power in our own hands by voting our own party, The Aam Aadmi Party (AAP). AAP is our party then why give our votes to Congress & BJP to rule over us. We should govern by our party for our Goa.